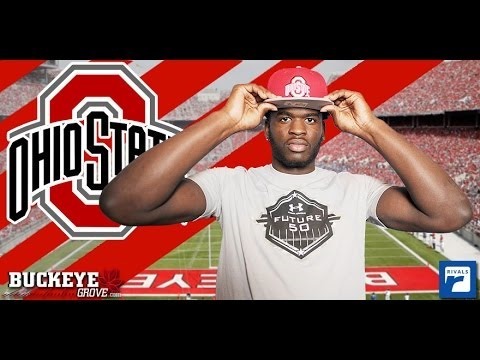 The top-ranked 2018 OSU recruiting class took a huge hit when DE Brenton Cox announced that he won't be playing with the Buckeyes. He apparently Tweeted out the end of his commitment after a visit to Alabama. This leaves OSU without a single DE in their recruiting class. Cox was supposed to visit the OSU campus later in the month. He would have been eligible to sign during the early signing period that starts on December 20. It's now unclear whether Brenton Cox will even make the visit at all. Senior defensive ends Jalyn Holmes and Tyquan Lewis are set to graduate, which means that the Buckeyes won't really have much in the way of scholarship defensive ends. Fourth-year junior Sam Hubbard could have left during the 2016 season, but he decided to stay in school for another year. He'll more than likely declare for the NFL draft in 2018.